Time: A 24-hour period during, the summer of 1955. Place: A small you-never-heard-of-it town somewhere in the Midwest. In the middle of a square state . . . In the middle of a square decade . . . In a square little town . . . Act I Natalie pumps gas at her father’s filling station and dreams (“Love Me Tender”) of riding off on her motorbike to find the man who will change her life. Who is not Dennis, her best friend and secret admirer. Unable to tell Natalie his true feelings, Dennis heads to Sylvia’s Honky-Tonk, where the townsfolk, black and white, gather to lament the grayness of their lives – “Heartbreak Hotel”. Suddenly, the sound of a motorcycle cuts through the air, as Chad, a mysterious stranger, appears on the horizon – “Roustabout”. When Chad stops in town to get his bike fixed, Natalie is immediately smitten – “One Night with You”. Sizing up the dreariness of the town, Chad electrifies a broken-down jukebox with his bare hands, infecting everyone with the rebellious spirit of his musk – “C’mon Everybody”. Horrified by the wild celebration, prim and proper Mayor Matilda Hyde arrives on the scene with Sheriff Earl in tow to restore order. Her dutiful son Dean follows in her wake, until his military school uniform catches the eye of Sylvia’s lovely African-American daughter, Lorraine. While tuning up his bike in the garage, Natalie tells Chad of her dream of the open road, and Chad encourages her to “Follow That Dream”. Chad heads into town, where he makes the awestruck Dennis his new sidekick. As the townspeople start pairing off like never before, Natalie sheds her garage overalls for a dress to attract Chad, but he falls instead for the beautiful curator of the town’s new museum of culture, Miss Sandra. Miss Sandra, however, has no interest in such an uncultured man – “Teddy Bear/Hound Dog”. Back at Sylvia’s bar, Natalie’s widower father Jim bemoans the lack of love in his life. When Miss Sandra enters, Jim is immediately smitten. Sylvia warns her old friend against falling for such a woman, but Jim pursues Miss Sandra anyway. Searching for Lorraine, Dean enters the bar, and the two youngsters find each other. Chad encourages them to pursue their forbidden love (“That’s All Right”), but Sylvia does not share the sentiment. When Natalie realizes that Chad is not remotely attracted to her, she devises a radical idea to get close to him. As Natalie rushes off, Dean’s mother, the Mayor, tries to send him back to military school to save him from Lorraine and the evil influence of Chad and his music – “Devil In Disguise”. As the bus Dean is on pulls out, Lorraine pedals after him, and they realize that they never want to part – “It’s Now or Never”. On the other side of town Chad’s sidekick Dennis suggests that Miss Sandra might fall for him if he sends her a sonnet by Shakespeare. Suddenly, the sound of another motorcycle rips through the air, and Natalie rides in, disguised as a roustabout named Ed – “Blue Suede Shoes”. Chad realizes a kindred spirit, and Dennis, out of love for Natalie, steps aside to let “Ed” be Chad’s sidekick. As Ed goes off with the sonnet for Sandra, Jim enters, seeing some of Chad’s expertise with women – “Don’t Be Cruel”. Sandra is so moved by the sonnet Ed gives her that she falls for him instead – “Let Yourself Go”. Outraged by the citizens’ frisky behavior, Mayor Matilda and Sheriff Earl sweep through town, where they discover Dean kissing Lorraine. Dean stands up to his mother, and he and Lorraine run off together. Matilda, blaming Chad, vows to throw the roustabout in jail. Chad seeks refuge in the nearby abandoned fairgrounds. Everybody in town is in the grip of something powerful and new, and – as the sun goes down – one by one, they all rush off to the old fairgrounds. Jim heads there, too, but not before kissing Sylvia, who suddenly discovers a new passion for her old friend – “Can’t Help Falling in Love”. 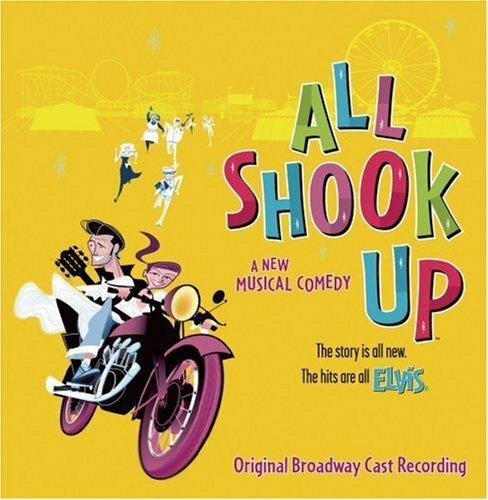 Act II Later that night, everyone in town has run off to the abandoned fairgrounds – “All Shook Up”. As they chase the objects of their affection, Chad reveals to Ed his total disinterest in Natalie. When Dennis tries to console Natalie (“It Hurts Me”), she rushes off but soon returns as Ed to try to convince Chad that there’s more to Natalie than meets the eye. When that fails, the frustrated Natalie/Ed tries a more direct approach – “A Little Less Conversation”. Chad, caught off guard, discovers that he has feelings . . . for Ed. As he tries to straighten himself out, he comes across Jim pursuing Miss Sandra (“The Power of My Love”), who also declares her love . . . for Ed. Jim runs off, aghast at his own foolishness. Chad confronts his double-dealing sidekick, but cannot bring himself to fight Ed. Chad realizes that, like it or not, his feelings – for Ed – cannot be denied – “I Don’t Want To”. Meanwhile, lost in her own imagination, Mayor Matilda dreams of the day when she finally puts Chad in jail – “Jailhouse Rock”. Sylvia finds Jim in another part of the fairgrounds and risks confessing her feelings (“There’s Always Me”), but having had his heart broken by Miss Sandra, Jim is unable to take in the feelings that Sylvia has for him. 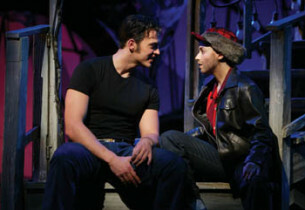 Although Dean and Lorraine are hiding out, Chad overhears their plan to run away, and he convinces the lovers that they must stay and fight for their right to love one another – “If I Can Dream”. As dawn approaches, Matilda tries to round up a posse to apprehend the roustabout, but Sheriff Earl, moved by the romance of the moment, refuses to arrest anyone. 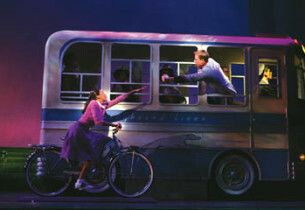 He confesses his long-time, silent passion for Matilda, and she, stunned by the power of his love, agrees to marry him. Jim realizes that his real love is Sylvia, and they, too, agree to marry. Chad then confesses his feelings – for Ed – only to learn that Ed is really Natalie. Chad is so shaken by the discovery that he gets on his motorbike and leaves town. Dennis finally tells Natalie that he loves her, but she gently turns him down. Miss Sandra discovers that it was Dennis who came up with the sonnet and, united by Shakespeare, the two fall in love. As everyone but Natalie heads off to the chapel to be wed, she assures her father that she’s better off alone – “Fools Fall in Love”. In the chapel next morning, a triple wedding is in full swing when Chad returns, to announce that, without Natalie, he has lost his music. He asks her to marry him, but she has other ideas. She’s going to follow her dream and hit the open road, and if he wants, he can come along – as her sidekick. He hops on, and they ride off, while the townsfolk celebrate their newfound joy of requited passion – “Burning Love”. Natalie Haller/Ed: Jenn Gambatese Dennis: Mark Price Jim Haller: Jonathan Hadary Sylvia: Sharon Wilkins Lorraine: Nikki M. James Chad: Cheyenne Jackson Mayor Matilda Hyde: Alix Korey Dean Hyde: Curtis Holbrook Sheriff Earl: John Jellison Miss Sandra: Leah Hocking Ensemble: Brad Anderson, Justin Bohon, Justin Brill, Paul Castree, Cara Cooper, Michael Cusumano, Randy A. Davis, Jennie Ford, Francesca Harper, Trisha Jeffrey, Michelle Kittrell, Anika Larsen, Michael X. Martin, Karen Murphy, John Eric Parker, Justin Patterson, Jenelle Lynn, Randall Michael, James Scott, Jenny-Lynn Suckling, Virginia Woodruff. 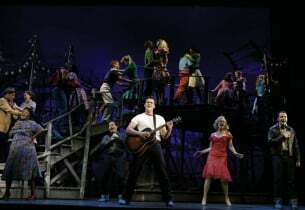 The songs made popular by Elvis Presley were the basis for this jukebox musical about a 1950s drifter, who settles in a small town for the love of a cute little girl, but has a hard time winning over the confidence and trust of the denizens. 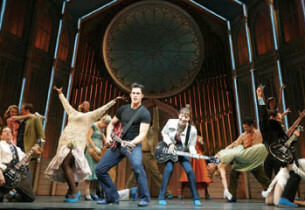 Written by Joe Di Pietro, the show, starring new Broadway idol Cheyenne Jackson, opened March 24, 2005 at the Palace Theatre, for a run of 213 performances.